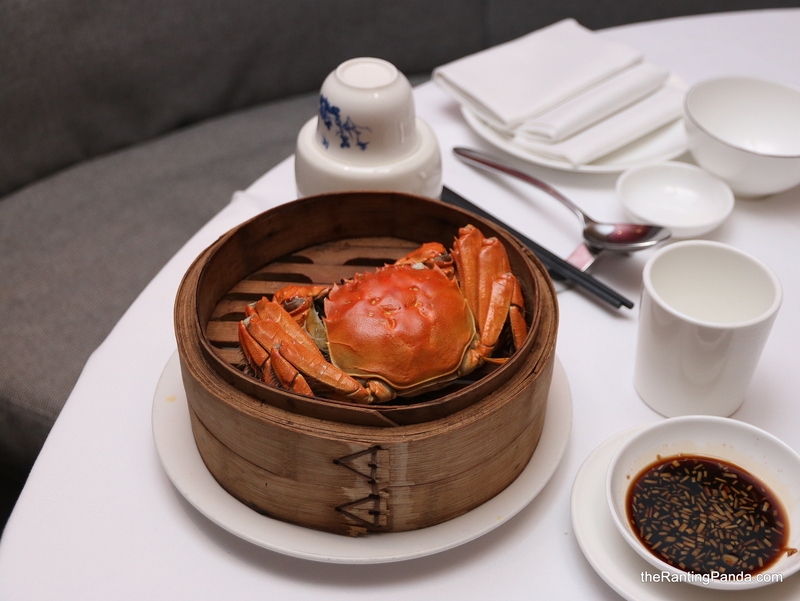 The Place Located at National Gallery Singapore, my last visit to Yan restaurant was about a year back and I had the opportunity to return recently to try its Hairy Crab menu. The modern Cantonese restaurant is the only Chinese restaurant in National Gallery Singapore managed by Park Hotel Group. For a limited time from 15 November to 15 December, the restaurant will be having the seasonal hairy crab dishes on its ala carte and set menu. The Food Unlike previous years where we get to enjoy hairy crabs from Yangcheng Lake in China, the Chinese supplies have been relatively low this year which partially explains the muted hairy crab offering in Singapore. For Yan, the restaurant has sourced its hairy crab from the Netherlands. For the Hairy Crab season, there is a 6-course Hairy Crab Set Menu available at S$128++ per person, or you can also opt for the ala carte menu. We started with the Steamed Xiao Long Bao with Crab Meat (S$12/4 pieces), only available during lunch. The huge dumpling is filled with generous hairy crab meat and the right amount of jus. Go generous with the accompanying vinegar. The following dishes I had are from the 6-course Hairy Crab Set Menu. The Steamed Sea Perch Fillet with Preserved Turnip and Seasonal Vegetables doesn’t have much of the hairy crab element, though the preserved turnip is stir-fried with miso paste and hairy crab oil. For someone who doesn’t usually take lamb, the Oven-baked Lamb Rack with Bacon is acceptable for me, where the lamb is simply marinated in salt and wine for a few hours. The Australian lamb here is tender and it doesn’t spot any gamy flavour. On to the main highlight of the meal, the Steamed Hairy Crab (S$68++ on the ala carte menu) here from the Netherlands can be paired with Chinese Wine like Shao Xing Wine or Nu Er Hong. Unlike the hairy crabs which I tried in prior years from Yangcheng Lake, the Dutch hairy crab is more about the meat than the roe. I am still able to taste the highly prized roe here, though it didn’t taste as luscious as the Chinese ones, if my memory of it didn’t fail me. Regardless, it is always nice to try something new. There is also an option to pair the Steamed Hairy Crab with the 10 Years-Aged Shao Hsing Yellow Wine (17%) at S$60++ per bottle. The Japanese Rice Noodles with Hairy Crab Meat and Roe was a good respite from the laborious efforts of extracting the crab meat. The crab meat here is cooked with superior broth to go along with the noodles, which was comforting to end the meal. To end off our meal, Hot Ginger Soup with Peach Resin and Glutinous Rice Ball is served which also counteracts the ‘cooling’ factor of hairy crabs. Rants Hairy Crab is a highly prized dish, this year in particular. Prices do not come cheap, though it is truly only once a year where you get to enjoy this seasonal delicacy. Will I Return Again? The set menu is more value for money in my opinion. If you have been itching to get your hands on hairy crab this season, these Dutch ones are worth a try. Make your reservation instantly at YAN here.